Yesterday we examined our DAM industry predictions for 2012. Today in the second part of the article, we analyse the technology predictions for the forthcoming year. The novelty factor of having a networked system that can deliver all of an enterprise’s media from one source is now pretty quickly beginning to wear off amongst end users and from our experience as consultants, it is being replaced by frustration and disillusionment with the slow rate of progress at addressing core issues, especially with reference to searching, workflow and batch processing. Our industry discussion yesterday revealed, however, that there are numerous groups of competitors amassing both within the DAM sector and outside it. The key risk in 2012 is that poor technology/development decisions will be made and many vendors might find themselves wrong-footed by 2013. At that stage, it maybe too late for them to change course. As discussed yesterday, however, the inertia present in the market might also enable them to survive providing they can re-focus on what the DAM market (specifically) wants rather than transient or nebulous trends in the wider tech sector. It’s important to remember that with the exception of archivists and digital asset managers, most users don’t really want to use a DAM system and don’t get much out the archival or retrieval process as an activity in itself. They usually want to carry out another task which also involves them sourcing digital media such as images, videos or documents (or even potentially contributing to them). Most end-users will prefer to remain in familiar environment of applications they already use rather than going off to another system and having to learn their way around etc. While they might have been willing to do this with previous incarnations of DAM systems this is really because of the novelty effect of actually being able to get to large repositories of media from a central location. In 2012 and beyond this will not be satisfactory any longer. Taken in this context, it seems increasingly likely that DAM systems will be more of a back-end tool that will not be directly accessed by end users. The DAM User Interface (UI) while important will be seen mainly by administrators rather than anyone else and their requirements are substantially different to more casual DAM users. 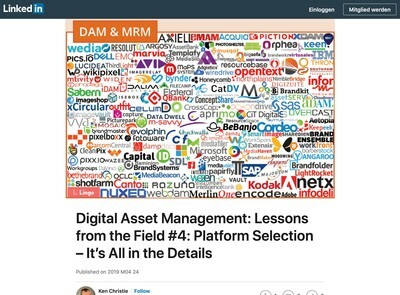 In 2012 we expect the users and controllers of DAM Systems to become professional human Digital Asset Managers and users of digital assets to access them through another integrated product. All this points to increased demand for integration with popular applications or services such as SharePoint, Microsoft Office, InDesign and WCM or other ECM systems. There will be a strong motivation to reduce the ancillary costs of IT system like training and support by keeping to core platforms as much as possible so as well as user demand, finance and procurement managers will favour tools with strong back-end capabilities that can be easily integrated into the rest of the business with minimal effort or disruption. CMIS and similar standards like oData have had a slow start in 2011 but it is often difficult for non-technologists to get excited about integration standards and therefore encourage their use. 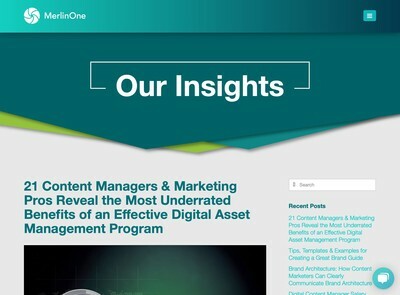 In 2012, these will acquire greater momentum as buyers start to understand the benefits of being able to use them and how they can help connect asset origination and retrieval to provide a more efficient digital asset supply chain. One area where there seems considerable demand is to replace conventional desktop DAM tools such as Lightroom and Expression that often get used because of the clunky nature of web interfaces. Many users still resort to these tools to get serious work done and then import assets into their DAM system for colleagues to use. That will increasingly be considered an unacceptable inefficiency and we see an ongoing convergence of web enabled tools (that can be delivered via SaaS or hosted software models) and legacy desktop cataloguing tools so they can be incrementally taken out of service. The original value proposition of DAM systems is searching and the ability to find media quickly: this will remain the key reason to invest into a DAM system (although users may not always initiate their search from within one, as we have discussed). The amount of digital media produced will keep increasing and the ‘findability’ problem will become more acute. At the same time, it will not be possible to ask over-stretched users to enter more metadata to help them find assets. A big priority in 2012 (and beyond) will be the ability of DAM systems to more intimately understand the asset requirements of users with less manual prompting (in the form of metadata cataloguing). Users will come to expect systems to use this context or usage data transparently to help assist with delivering more relevant searches. This does not mean that that cataloguing will become any less important but users will want to spend less time doing it in order to get reasonable search results. While many end users are still wedded to their shared drive ‘folder’ metaphors we expect this preference to gradually decline and more subject oriented metadata models to be more widely recognised as offering a superior way to describe assets. Some DAM systems already support this model and we expect more to do so in 2012 as the shared drive legacy begins to get forgotten about and go the way of the floppy disk or rubber eraser as an obsolete reference point that your younger colleagues don’t understand the significance of. Another core area of demand is for DAM systems to be able to batch process assets. As the quantity of media they hold grows it will become increasingly more difficult for users to download large sections of assets, process them with some offline desktop application like Photoshop and re-upload again. Users will want to be able to do many common batch processing tasks within the system and to have a UI that makes this easier for them. One of the driving factors for this will be the desire to reduce the cost of upgrading desktop tools and paying out for licenses but also for convenience and to achieve more optimised digital asset supply chains. Based on our discussions with end users in 2011, the key requirement many have is tools to deal with the ever expanding scale of assets that their DAM must hold. Many vendors are keen to talk about how many objects their system can physically hold but the ‘management’ element of DAM is still not being adequately addressed. If you read other predictions for the tech market in 2012 you will see mobile being mentioned quite a lot and it is almost certainly the case that it will have an effect upon the DAM market but not (in our view) to the same extent. In terms of a gradual shift away from desktop computers and towards devices that can be more portable and even users bringing their own equipment to work rather than making do with their employer-issued workstations then mobile is a definite trend with momentum. Many DAM vendors (and some users too) however, are getting onto the mobile bandwagon without fully understanding the benefits for users. As an interface for general use, mobile presents limited opportunities for improvements to the user experience. There are some groups such as field personnel like sales staff who might benefit from being able to access assets, but as we have already discussed, many of these individuals will do so via some intermediary application such as PowerPoint or an HTML5 presentation. The major value proposition for mobile DAM is asset capture. If your DAM operations involve a lot of assets being originated or sourced in the field there is a greater opportunity to make use of devices such as tablets and mobile phone applications. The ability to streamline the digital asset supply chain and simultaneously improve workflow is one area where mobile can more demonstrably offer a tangible benefit. But for what you might call ‘human digital asset managers’ who are going to be working extensively on more stationery DAM related tasks like cataloguing existing assets, the benefits are less clear cut. For this group of users, a soft keyboard and imprecise touch-screen does not offer the satisfactory levels of control they need. Just like typing long documents on a tablet is an unpleasant experience, so too extended interaction with increasingly sophisticated DAM systems will be unappealing for many human digital asset managers who have to routinely do complex operations to thousands of assets. Our prediction is they will prefer a chair, desk, large screen, keyboard and monitor until there is a significant improvement in the quality of interaction over an extended use period rather than the casual browsing that most users engage in on their tablets when reading books or surfing the internet. The convenience of being able to access a DAM remotely from a mobile device will be welcome but the experience will be unsatisfactory for extended work. An area where tablets might begin to acquire momentum (and therefore have potential significance for DAM) is if the price becomes dramatically lower to make it more cost effective for IT departments to deploy them instead of workstations for end users (although again much depends on how many users still directly access the DAM system). At the start of 2012 the tablet market looks poised for a serious price war where players such as Amazon will attempt to leverage their other sales channels to subsidise the cost. The new Amazon Kindle Fire tablet uses the Google owned Android operating system. Other market participants such as Microsoft (via Windows 8 ) and Apple via iOS will all be looking to compete in one way or another. As happened with the desktop market, this means it is likely that different mobile OS vendors will ultimately converge and copy each other. Developing a dedicated DAM UI for any of these platforms exclusively is a high risk strategy for DAM vendors and many may adopt a ‘wait and see’ strategy. The fact that it is already feasible to use a web based DAM on most tablets will reduce the urgency to provide something special for this market (other than for enterprise vendors who have hitherto relied on dedicated desktop clients). For these reasons we foresee mobile have a much lower impact on the DAM market than it might for other software and IT sectors and unless mobile asset capture and cataloguing is a key requirement for your organisation, then mobile DAM might be fairly irrelevant. The workflow controls in most DAM systems have historically been relatively poor and lacking in sophistication. Some have overly simplistic features that make it difficult to easily model real world review and approval scenarios. Others are too complex for end users to grasp and often require supporting ‘designer’ applications etc. End users will want this to change in 2012 and there is evidence to suggest that this trend is already in play. The workflow models in many ECM and WCM systems are frequently superior to DAM systems because they generally have many more users and developers than DAM and many activities are similar. This might be one area where hybrid technologies that leverage both aspects might begin to become more popular and DAM systems being pushed increasingly to the back-end. Some ECM vendors are taking the approach of building DAM modules to integrate into their suites, other independent vendors of media processing tools are electing to leverage well known ECM or WCM platforms like SharePoint or Drupal. 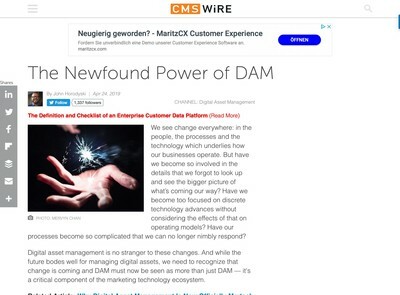 If DAM systems and WCM become more integrated it will be interesting to see whether DAM systems improve their workflow capabilities or if they ignored as end users bypass them a anyway. It is noteworthy that the DAM elements which WCM tools are often reproducing are the processing and storage features – this fact indicates what most users regard as the key strengths of current DAM systems. As we reported right at the end of 2011, it looks like industry bodies representing asset suppliers might finally be getting their act together and moving towards widespread adoption of embedded metadata and applying some pressure on the tech industry to respect the concept more readily. For copyright owners embedded metadata offers significant protection against ‘orphaned works’, this is intellectual property where the original owner cannot be identified (e.g. downloading a picture from the internet which has no attribution). As a result, we expect to see more IP owners being keen to not only embed metadata but ensure that the systems they deposit into support it properly also. For DAM users, standards based embedded metadata considerably simplifies integrated digital media supply chains. The asset itself holds the core metadata and can be transferred from one system to another as a single self-contained unit. While there are standards for APIs to enable transfer from one system to another (such as CMIS), they are not always fully implemented and there are differences between systems even if they have sought to use a common standard. Embedded metadata does not remove the need for other APIs but it does provide greater assurance that metadata is less likely to become separated from its associated file essence and re-enforce the ‘asset’ concept as being entities that are composed of both files and metadata in combination. 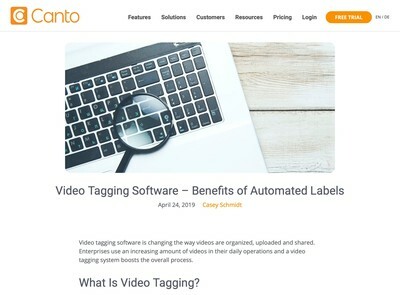 Apart from media industries, many end users have not yet properly caught on to the potential for embedded metadata to reduce the effort required to catalogue assets by externalising it to their asset suppliers. We expect this to change in 2012. With less staff required to process more assets those who are not yet up to speed with the benefits of this technique soon will be. The major lesson that 2012 seems likely to deliver for vendors is to ignore user’s DAM needs at your peril and for end users it is to concentrate on solving key issues as comprehensively as possible so you don’t need to revise your product choices or add ‘bolt on’ modules (with the additional cost and complexity that involves). DAM systems have an advantage as the original tools for large scale media management but many others can quickly be adapted to reproduce their basic functionality with either additional features thrown in (WCM or ECM) or at vastly lower cost (via commodity offerings). To retain the pre-eminence as a ‘required’ purchase for any business with thousands of digital assets that DAM systems have acquired in recent years, they need to stay ahead of the curve by extending their core features in the form of vastly improved searching capabilities, workflow that more easily models the tasks real users need to carry out and time saving features like advanced batch media processing. Simultaneously they must be ready to integrate other tools and accept the reality that in many cases, the DAM system will be a cog in the wheel (or ‘media hub’ if you prefer) that runs silently in the background as far as many users are concerned. If you are a vendor and having read that paragraph you think your tool already does all this – then you are in the group of vendors who is at peril in 2012. On the other side of the coin, if you are a user and finding that your vendor isn’t as interested in productivity enhancements as you are and instead are more concerned with showing you how well their DAM system runs on iPads then you should consider your options in 2012: you will have plenty of other choices.